In 1880 industrialist George Pullman set out to build a capitalist utopia. The town of Pullman was established just outside of Chicago as a model community—a place that was supposed to produce both happy workers and a nice return for Pullman's investors. It turned out to be a miserable failure. And conditions in the town were so terrible that it was the catalyst for one of America's most famous strikes: the Pullman Strike of 1894. Americans were told that the community of Pullman was both scientific and the visionary project of a lone genius. It was to be an ambitious experiment in transforming American society; and even though it borrowed heavily from the ideas of company towns already developed in England, it was to be a shining example of ingenuity for the entire industrialized world. The idea was to build a city from scratch—a town with Pullman-owned factories, Pullman-owned shops, and Pullman-owned housing. "Pullman is the only city in the world built scientifically and artistically in every part, and from a central idea within one man," Duane Doty, an engineer for Pullman, wrote in 1888. The site of Pullman was ten miles south of the Chicago border at the time—not that far away, but far enough from the city to feel like its own community. For better, and certainly for worse. At its peak the town would house about 12,000 people. And Pullman sunk over $6 million into the community in the first three years alone, building modern sewers, providing indoor plumbing, and planting over 30,000 trees and plants. But it would all prove a ridiculous folly awash in hubris and greed. George Pullman had made his name in the railroads, delivering the first "Pullman Palace Car" to the world in the 1860s. The idea was to bring refinement in train travel to the middle class—a more civilized train experience that allowed one to travel in style, at four times the regular price. Pullman leased his cars (generically called sleeping cars by the 1880s) to the country's railroad companies. Slowly but surely they became a smashing success. Pullman's utopian community was seen as a natural extension of that vision. If he could put some civility into train travel, why not inject some into his low paid workforce? Not to mention make a hefty profit from them in the process. Pullman's town was essentially one giant experiment in building the model employee, while making as much money from them as humanly possible. 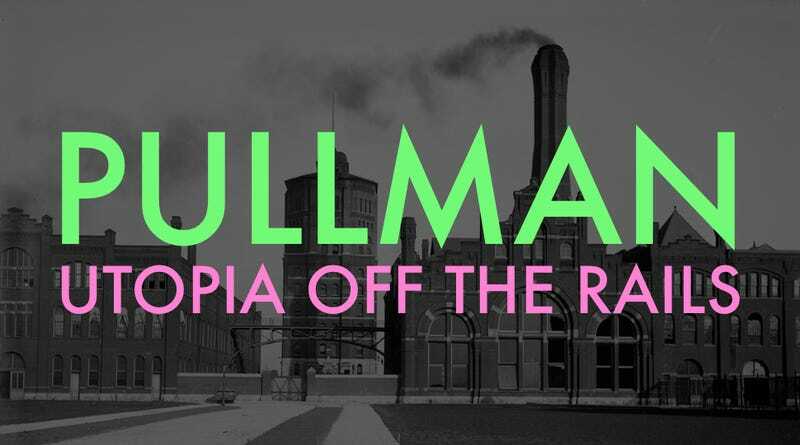 "His interest in building a town was in trying to find a way to perfect capitalism," Dr. Jane Eva Baxter who has done extensive research on Pullman tells me over the phone from Chicago. "So he wanted to create a company town where everybody would be in conditions that would allow them to be content with their place in the capitalist system." Pullman believed that the working class were little more than unrefined brutes. If he could just surround them with the finer things in life, he believed they would shed their odd, backward, immigrant ways. "I want the people who work at Pullman to have the advantages of seeing the best," Pullman said. "I want no cheap, crude, inartistic work in any department. I have faith in the educational and refining influences of beauty and beautiful and harmonious surroundings, and hesitate at no reasonable expenditure to secure them." But that beauty would come at a terrible price. "The town would be profitable, and would pay money to investors," Baxter explains. "The workers would be given better living conditions than they were afforded in a typical urban settlement and through the working conditions they would be happy to be workers. And [Pullman's] idea was that you could create a visionary community where everybody could be happy with whatever they were doing to make the company go." Everybody had their place in the new town of Pullman, and no one was to deviate from that place. Nor the strict rules laid out by the central planners. "The Pullman vision includes some very deliberate social engineering," Baxter tells me. "Who you are in the factory system determines the type of home that you would be living in. And the community is laid out according to a plan where certain types of people are living in certain types of places in the community." Pullman's managers lived in single family homes with their families. The white workers of Pullman lived in tidy rowhouses like the ones seen above. Workers weren't allowed to own their homes, but instead were forced to rent them. Despite the fact that Pullman was one of the country's largest employers of black Americans as sleeping car porters, no black people were allowed to live in Pullman. Some white workers were sometimes allowed to live outside of the city limits, but it was made quite clear that those who lived inside Pullman were the preferred employees. If you didn't live in Pullman your job was never very secure at the factory. George Pullman himself didn't live in the community, but instead had a mansion in Chicago. In Pullman's eyes, everything seemed to be just fine with this experiment in paternalistic capitalism. But things would go south pretty quickly after the workers actually moved in. George Pullman was a Universalist and a prohibitionist. The town had just one church which ostensibly could be rented by a congregation of any religion, but proved insufficient for his workforce which was comprised of many faiths. The town had its own library, but again, though it looked like a fine thing to have from the outside, it didn't really serve the community. Few workers could afford the $3 membership fee—roughly $100 adjusted for inflation. But workers dared not to say anything negative about the arrangement. Aside from owning everything in town, Pullman employed spies to keep watch on everything residents did and said. Pullman also forbade alcohol in the town, though there was one place it was served—the posh Hotel Florence (named after Pullman's daughter and pictured below) and a place where the average worker was not welcome. Out of town guests with enough money could imbibe as they pleased. The town had a shopping center (known as an Arcade) that was the only game in town. Prices were inflated, despite promises of "lowest Chicago prices" on the banner below. But the Arcade was no doubt impressive on paper. The complex had a 1,000-seat theater, a barbershop, doctor's offices, a U.S. post office, and a bank, along with its numerous overpriced shops and restaurants. But what happens when you take away a worker's personal freedoms and gouge him left and right? He's going to inevitably resent the people pulling the strings. Pullman's working class were largely immigrants from European countries—people with traditions and ways of building a community that they wanted to replicate in some fashion in Pullman. "So you take away the major way that these communities would've socialized in Europe, socialized in their neighborhoods here in the U.S. and you strip that away," Baxter tells me. "If you want to shop in Pullman you're shopping in a store that's not going to look like a store that you'd normally go to—it doesn't have products that you'd normally buy, you're not going to be able to have transactions in a language that maybe is easier for you. And all of these things add up." Baxter is most interested in what came after Pullman was sold off. She's currently researching the ways in which urban working class communities were organized at the dawn of the 20th century. Communities drawn along ethnic and religious lines couldn't form in the same ways thanks to Pullman's restrictions on congregation and drinking. Europeans immigrants naturally resented the inability to form communities as they wished. Boosters of the Pullman experiment pointed to a lower death rate in the town than both national and world averages. They pointed to the excellent sanitation as the reason and they were almost certainly right. But that cleanliness wasn't cheap. And if you were to suddenly exclude anyone who couldn't afford to live in Pullman, then of course the death rates most associated with disease contracted from poor sanitation would go down. Pullman was a shining example of cleanliness—like the most brilliantly scrubbed toilet bowl the world had to offer. If you're starting to wonder why so many of the photos of the city are completely devoid of people, there's a very simple explanation: Pullman forbade public gatherings not sanctioned by the Pullman Company. It may have been picturesque, with its ornamental lake and lush parks. But who could enjoy them with bans on any large gatherings? In looking over all the facts of the case the conclusion is unavoidable that the idea of Pullman is un-American. It is a nearer approach than anything the writer has seen to what appears to be the ideal of the great German Chancellor. It is not the American ideal. It is benevolent, well wishing feudalism, which desires the happiness of the people, but in such way as shall please the authorities. The American feudalism that Ely decried would fold under the weight of its first major test, less than a decade later. In 1893 the American economy tanked after a financial panic. Chaos begat chaos as banks failed and the American economic system was revealed to have been a house built on sand. It would begin the worst economic Depression that the United States had ever seen until that point. After the devastation of the 1893 market crash, Pullman laid off large numbers of workers. He gave preference to those living in the town of Pullman, but slashed wages. One thing he didn't slash? Rents. In fact, some workers (whose rents were often automatically deducted from their paychecks) found that they literally only had pennies left to live on after getting paid. One man has a paycheck in his possession of two cents after paying the rent. He has never cashed it, preferring to keep it as a memento... another I saw the other day for seven cents. It was dated September '93. The man had worked as a skilled mechanic for ten hours a day for twelve days and earned $9.07... His half-month's rent amounted to $9.00. The seven cents was his, but he never claimed it. The situation was clearly unsustainable. Despite the fact that his company was worth roughly $62 million in 1893 (an astronomically larger amount when you adjust for inflation), George Pullman would not concede an inch in the town that bared his name. His greed would ultimately prove the town's undoing. The deplorable financial condition of the workers in Pullman inspired cartoons like the one below. It had all began with such lofty goals, with those who examined the town hanging their hats on the social theories of the day. Rational capitalism would win out, commentators assured the public. "Here, indeed, seems to be the coming paradise of labor," one writer who had visited Pullman proudly wrote in a 1882 edition of The Railway Age Monthly. "If here are not all the conditions for a healthful and mutually beneficial relation between the great and powerful corporation that furnishes capital and employment, and those who seek and find employment, the best and most approved social theories are at fault." Those social theories would at least have to be re-examined, then. "Capital will not invest in sentiment nor for sentimental considerations for the laboring classes," that same writer would opine. "But let it once be proved that enterprises of this kind are safe and profitable and we shall see great manufacturing corporations developing similar enterprises, and thus a new era will be introduced in the history of labor." But after a rough and tumble decade this supposed paradise would become the epicenter of American labor's struggle against industry—a shining example of the failures of arrogant businessmen who believed they had found the utopian answer to America's labor problem. All because the bottom had fallen out, and nobody at the top was willing to accept a financial loss. This capitalist utopia was to be built on the backs of the working people. But they wouldn't take it for much longer. Officially, joining a labor union was against the law in the town of Pullman. But that didn't stop the workers who were fed up with their condition. In 1893 the Pullman Company had about 14,000 employees spread out across the United States. The town of Pullman itself (not exclusively employees) had about 12,600 residents. On May 11, 1894, some 4,000 workers of Pullman's utopian community went on strike with the American Railway Union (ARU). In the coming weeks roughly 250,000 other laborers around the nation would join them. The strike caused both the Pullman company and the nation to grind to a halt. Eugene V. Debs, a labor activist and then head of the ARU ordered Pullman cars unhooked and set aside. He also stopped the mail from running. Pullman hired strikebreakers to bust heads and intimidate the workers. But many, especially those living in the experimental city of Pullman, felt they no longer had anything left to lose. What were they working for if all of their pay was taken away for rent and they couldn't afford to feed their families? It wasn't long before the federal government stepped in. But, as you can imagine, it wasn't to help the workers. On July 3, 1894 President Cleveland called out troops to Chicago and Pullman. You can see them above in front of the Arcade Building in Pullman. Within three days rioting would start in Chicago, with hundreds of train cars looted and set aflame. What had up until then remained a generally peaceful action (at least on the side of the workers) had turned incredibly violent. When I ask Dr. Baxter about "the strike," referring of course to the Strike of 1894, she kindly reminds me that there were a number of strikes during Pullman's existence as a company town. Utopia this was not. "The town of Pullman was built and gets up and running in 1880-81 and the first strike is in 1882. And there were many strikes long before this strike," Baxter tells me. "So one thing I encourage people to think about is that there never was a utopia in the first place." As much as two-thirds of the country's rail transportation was affected by the 1894 strike. The mail stopped being delivered. Eugene V. Debs indeed made his name in Pullman and would eventually serve time in jail for conspiracy to obstruct the mail and refusal to shut down the strike. He would emerge from jail a socialist after having read Karl Marx, something he apparently never had time to do before getting locked up in Woodstock, Illinois. If Pullman's capitalist utopian experiment had achieved anything, it was making a socialist out of what would become one of America's most famous labor activists. "[Pullman] really wanted to create a place where there would be no need for a strike—that workers would be so content that you would never have labor unrest," Baxter tells me. "Well, labor unrest starts within a year [of the town's formation]. So the vision never really has any kind of traction." "Unlike other utopias, people just wanted jobs. They're not necessarily buying into Pullman's vision. It's not a shared intentional community," Baxter says, reminding me of other failed utopias we've explored on Paleofuture like Upton Sinclair's Helicon Home Colony in New Jersey during the first decade of the 20th century, and Frank Lloyd Wright's Broadacre City plan which would first emerge in the 1930s. Whether socialist, capitalist, libertarian, or merely technocratic, everyone has to buy into one particular brand of utopia for it to even get off the ground. Anything else is simply a dictatorship. "It's Pullman's idea and then a bunch of workers working for him. And trying to live in the context of this idea," Baxter explains, revealing the biggest flaw in the Pullman plan. Few people in Pullman felt like it was their own home, let alone an ideal they could get behind. Over a dozen people were killed in the ensuing battles of 1894. By early August, with workers unable to afford more lost wages, labor leaders in jail, and troops showing no sign of weakness, the Pullman strike had collapsed. Many of the striking workers who belonged to unions were fired and any who lived in the capitalist utopian town of Pullman were thrown out on their asses. There were no concessions by the company and they continued to pay the same abysmal wages while charging exorbitant rents. At least as long as the town stayed in Pullman Company hands. More than $1 million in property had been destroyed in Chicago, but compared with the brutal battles there, ten miles to the north, the strikes in Pullman stayed relatively subdued. Above we see the National Guard camped out at the Florence Hotel. After the strike was effectively crushed nationwide, President Cleveland commissioned a report to investigate its cause. The final report (which was incredibly long at over 1,000 pages) found that George Pullman and his utopian experiment to be both landlord and employer in some capitalist's paradise had been the match that lit a fire under the burgeoning American labor movement. "The aesthetic features are admired by visitors, but have little money value to employees, especially when they lack bread," the report asserted about the town. Sure, Pullman had built a gorgeous little town. But even with all of its authoritarian rules aside, no worker actually wanted to live there if they couldn't provide the basics for their families. The courts would ultimately rule that the Pullman experiment had to end. The town would slowly be sold off piece by piece over the next decade, becoming like any other working class Chicagoland suburb. "The Illinois Supreme Court required Pullman to make a choice: They said you can own the company or you can own the town. You can't own both," Baxter tells me. "And he of course chose the Pullman Palace Car Company and kept the manufacturing business and had to sell off the town. And as soon as workers were able to purchase homes the whole thing ends and the community changes." George Pullman died on October 19, 1897. He was so despised his family became worried that his workers might dig him up. To make sure that no one would desecrate his remains, Pullman was buried much deeper than usual, encased in thick concrete and under large railroad ties. The burial reportedly took two full days. Upon learning of the rather elaborate burial procedure, journalist Ambrose Bierce was said to remark, "It is clear the family in their bereavement was making sure the sonofabitch wasn't going to get up and come back." Pullman—both the man and the town—was unable to deliver a capitalist utopia. At least for his workers. Because with his investors making a guaranteed 3 percent on the town, even in the worst of times, his capitalist utopia certainly seemed to work just fine for those with the capital. But you can only screw people over for so long before they start asking for their own utopia. Or at the very least, a wage to live on.